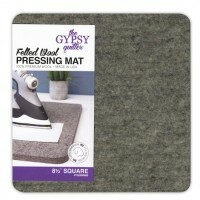 Tips and Tricks The pressing mat can be used with a dry iron on any surface. If using steam, place the mat on a protected surface since moisture does go through the mat and can harm the surface below. Never place the mat on a rotary cutting mat when pressing. The heat could warp the cutting mat. If mat feels damp after use, hang to air-dry before storing. Wash the mat occasionally by rinsing it in cold water and hanging the mat until dry - especially if using a spray starch. Safe surfaces include Formica, Corian, stone, and metal (an ironing board). Wood and painted surfaces should be avoided. A wool mat is a handy tool for quick pressing when kept next to your sewing machine.